Editor's note: This review appeared on Dangerdog Music Reviews in 2008, written by former contributor Tim Carroll who received a personal copy. It is repeated here because Nightmare Records included it with their November 2009 promo package to DMR world headquarters. There is a lot of diversity on this disc, even for a prog band. The disc�s opener �Recognizing Fate,� sounds a bit choppy and disjointed at first, but the band quickly settles in and delivers some of their most powerful material yet. Second track �Slaves Of The Plethora Season� is a memorable, buoyant tune and has a 70�s classic rock vibe to its keyboards. �Worst Enemy� is a heavy yet slower song, with deep lyrics about inner conflict that most of us can relate to. �Another Step� is a screamer that sounds more like it would belong on a Symphony X album; and closer �Veil Of Illumination� is a griping 17-plus minute epic. Everything on �The Immunity Zone� is done with class and sounds great. 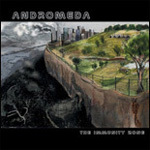 Like most progressive metal bands, Andromeda�s sound can be an acquired taste. In the case of �The Immunity Zone� it only takes a few spins before you are salivating for more. It might not be the instant classic that �Extension Of The Wish� was, but it�s definitely a step back in the right direction for Andromeda. It may take, and possibly require, significant spins to understand Dynahead's Antigen, but it is more than worth the experience. Dynahead could be the future of intelligent modern heavy and progressive metal.